Moving Panda production to near Naples, Italy from Poland would cost millions. TURIN -- Fiat could move production of the Panda, Europe's best-selling minicar, to Italy from Poland starting in 2011. But doing this would cost "hundreds and hundreds of millions" more, Fiat CEO Sergio Marchionne told Italy's government and unions on Tuesday, according to the text of his speech. Relocating Panda production to Italy will help Fiat meet an Italian government request to raise domestic passenger car production by 50 percent to about 900,000 units a year. Fiat currently builds the Panda in its Tychy, Poland, factory, which also builds the Ford Ka as well as the Fiat 500 and Seicento. Marchionne was expected to announce that the next-generation Panda could be built in the carmaker's Pomigliano d'Arco plant, near Naples, southern Italy, if the factory's costs are reduced. Marchionne said that restructuring the plant in the southern region of Campania would require extending temporary layoffs, according to the text of his speech. Production costs at Pomigliano are several hundred euros higher per unit than in Poland and Marchionne wants to tie any new production to workers agreeing to reductions as well as politicians approving incentives to help retool the plant. 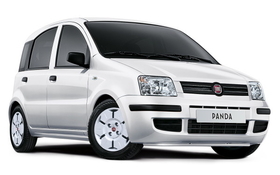 Fiat likely will sell 300,000 Pandas this year, the car's best annual sales since it was introduced in 2003. The automaker plans to build about 270,000 units a year of the next-generation Panda. Last year, passenger car production in Italy fell 27.6 percent to 659,211, the lowest level since 1960 when 595,923 units were built, according to ANFIA, the Italy's automakers association. Italy slid to No. 6 in Europe in terms of car production behind Germany, France, Spain, the U.K. and Belgium. From January to October, Italian passenger car production slid 8.3 percent to 558,629 and is set to finish the year at about 600,000. • Mirafiori, Turin, will continue to build the Alfa Romeo MiTo, the Fiat Idea and Multipla and Lancia Musa including the Idea and Multipla successors starting in 2011. • Melfi in central Italy will remain the sole production site in Europe for the Fiat Grande Punto and its refreshed Punto Evo variant. • Cassino in central Italy will build the new Alfa Romeo Giulietta and continue producing the Fiat Bravo and Croma and the Lancia Delta. • Sevel Val di Sangro in central Italy will continue to produce the Ducato range of light commercial vehicles and its sister models for PSA/Peugeot-Citroen.